I'm a huge fan of the burgeoning trend of gourmet food trucks hitting the streets of DC. Today, I popped by the Arlington Farmers Market in search of my next farmers market challenge ingredient, but what I got most excited about was a cute little trailer with a big sign that said: BREAKFAST TACOS. You had me at hello, District Taco. District Taco tends to hover in the Rosslyn, Crystal City zone, which is probably why I hadn't caught them before. For breakfast, they offered a choice of tacos with egg, cheese, salsa & two toppings - and also a veggie version (which I appreciate). The toppings were a great selection of really fresh ingredients like onions, jalapenos, rice, beans, guacamole, chorizo, etc. I had the opted for the veggie tacos since I'd already had breakfast. Enveloped in a warm, soft flour tortilla was a hefty portion of crunchy fresh veggies, cheese, beans, jalapenos and guacamole. You can get one taco for $3, two for $5, or three for $7. I'm a fan. Hope they expand into DC proper soon - I could see these being a lunch fixture for FloridaGirl. 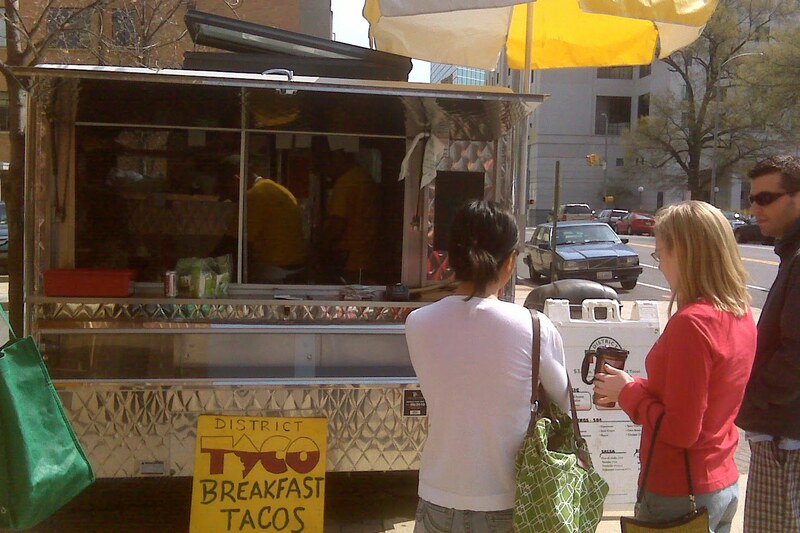 You can follow District Taco on Facebook or Twitter to find their location.